If the more than three hours of film that comprise Ride Along and its slapdash sequel, Ride Along 2, were distilled into one scene, it would be the following. 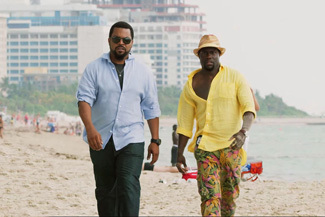 James (Ice Cube) and Ben (Kevin Hart) approach a strong, silent criminal. James asks him for information; before he can respond, Ben interrupts. Ben launches into a stream-of-consciousness monologue containing an elaborate metaphor that no one can follow. Then Ben trips over his gun and falls into a chicken coop. The criminal runs but is easily caught by James. Ben finds an ultimately inconsequential clue hidden in the chicken coop. Can you picture that happening about 15 times across two films? Then you've imagined the Ride Along movies. That's not necessarily to say that they're bad; in fact, they're often quite funny. Hart is a gifted physical performer, with command of seemingly outlandish motion (and expression) that recalls Jim Carrey's more slapstick moments. And while Ice Cube is not much of an actor, he's quite good at giving Kevin Hart exasperated glares, which is more or less all that's required of him. Little has changed since the events of Ride Along, when James tried to scare Ben away from pursuing a life in law enforcement, only to find Ben possessed a limited aptitude for crime solving. Now Ben's a rookie officer, still following James around in hopes of a career boost. He's about to marry James' sister, Angela (Tika Sumpter), who begs James to take Ben along on a Miami case; she needs Ben away from the wedding planner. The pair head to South Beach to interview a computer hacker (Ken Jeong) with ties to Atlanta crime. With the help of local homicide detective Maya (Olivia Munn), though, they discover more than they reckoned with, to the tune of an international smuggling ring. The action scenes in Ride Along 2 don't have the oomph to make up for the lack of laughs whenever they break out; I'm baffled as to why anyone thought that this movie needed a single serious moment. And Jeong and Munn, both funny performers, go more or less to waste; sure, they're funny, but Hart is talking and/or flailing in every scene, so no one else has room to get a word in. But it's Hart that made the first film its cash, and why mess with what works? Both films are fine for a cheap laugh.